This recipe is another impromptu invention that I came up with while not knowing what to cook. I must say that my best dishes come through when I don’t know what to cook. I love utilising my pantry to the optimum to create new dishes. I had bought zucchini and knew I wanted to make zucchini spaghetti, but I didn’t know about the sauce. I knew I wanted a vegan sauce, so I soaked some cashew nuts knowing that this cashew sauce would become handy. The result was an exquisite Italian style tomato sauce and a great companion to pasta! We had plenty of tomatoes in the fridge, so I immediately thought of tomato sauce since I don’t often buy ready made tomato sauce. The recipe is very easy whilst and uses simple yet authentic ingredients. I loved the smell and taste of basil and oregano in this sauce. The sauce smelled so good and looked like traditional Bolognese or Italian ragu. 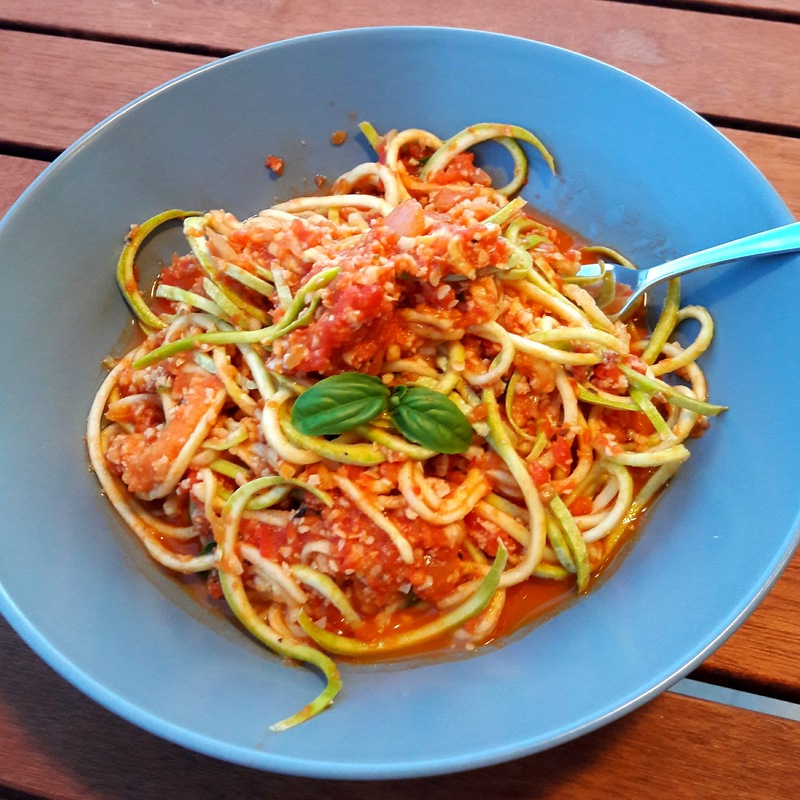 It was also great served with normal pasta or with zucchini noodles made with this spiralizer. This is happy food for me, it looked nice, smelled delicious, tasted great without using animal products in the process. How to easily peel tomatoes? To be able to peel the tomatoes easily I soaked them in hot boiling water for about five minutes. Then I rinsed the water, covered the tomatoes in some ice and added more water. This allowed me to peel the tomatoes with a knife easily. Soak the raw cashews in water in advance. This will allow them to soften up. Use the easy method suggested for peeling the tomatoes. Stir fry the onion in olive oil and add some pepper. Meanwhile, blend the tomatoes in a food processor. When the onion has softened, add in the garlic. Then add most of the pureed tomatoes reserving some in the food processor. Blend cashew nuts in the food processor together with the remaining tomatoes. You can puree completely or leave some chunks. Add this cashew mixture to the simmering tomato sauce. Add a good pinch of salt, oregano, chilli flakes, nutritional yeast and coconut sugar if using. Stir the mixture from time to time and let simmer for about 10 minutes to allow the flavours to soak in. Switch off the heat and add in pieces of fresh basil. Add in the cooked pasta or raw zucchini spaghetti and serve immediately. If you want warm pasta, you can switch on the heat, but I find zucchini to be best when raw as otherwise, they will become mushy.